This card is proof that the only way to come up with an idea is to sit in your crafting space and keep trying things. I had absolutely no idea it would end up where it did! 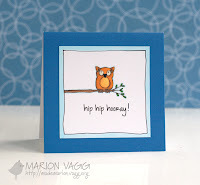 I love the whimsy in Marion's card, and the doodled frame with the coloured edges. I went through all my stamps (and that's getting easier thanks to a big purge I've been working on!) and realized that in its original form, this Stampin' Up butterfly has an attached sentiment in a similar font to the one Marion used. 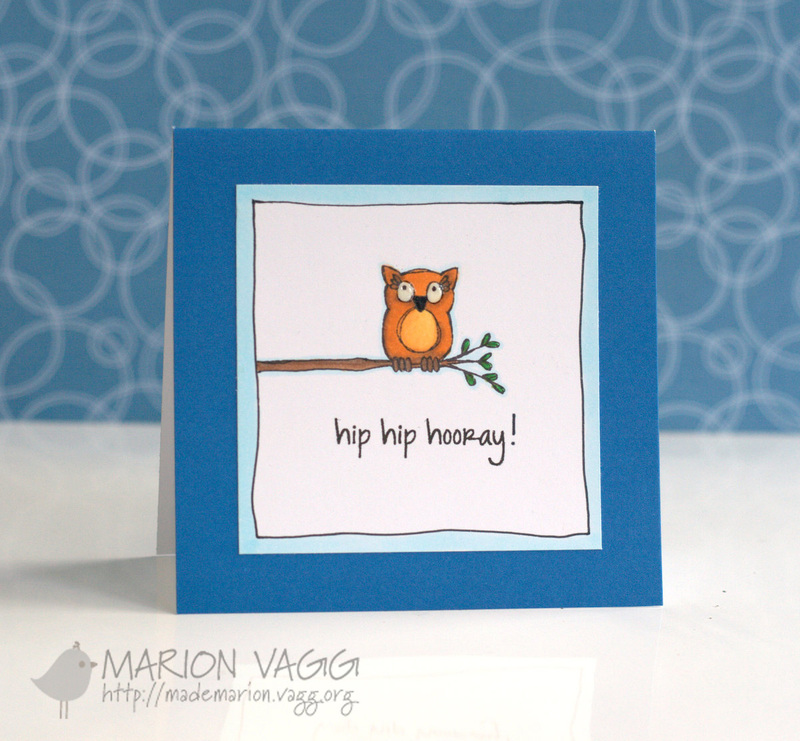 I thought I would simply remake Marion's card with the butterfly instead of an owl. And then I stamped the butterfly and my brain 'pinged' (as my friend Bev would say!). The butterfly has a frame built right in! AHA! So my butterfly's body is unusually coloured to mimic the owl's body, and in the end, I used a completely different sentiment. I finally doodled the black frame and called it done. I have so far neglected to mention that a week ago, I was lucky enough to be invited to get together with 3 other stamping ladies in my 'neighbourhood' (actually, 2 out of 3 of them really are! ): Natasha Kara, Emily Leiphart and Tracey McNeely. Here we are, all smiles, after 5 hours (yes 5) of NOT crafting. I managed to make a few die cuts with some dies that Tracey brought along, as well as comparing some of my favourite old, discontinued Stampin' Up inks with various other companies' offerings, to determine what I can replace them with when I need to (ie Summer Sun almost equals Memento Dandelion, Green Galore almost equals HA Grass, and while MFT's Red Hot is gorgeous, it isn't quite as 'blue' as Real Red). Beyond that, we were chatting, laughing, snacking (oh yes, Natasha is a wonderful and generous hostess!) and planning for our next get together! Phew, this is a long post, but I still have to say that there is still time to play along with us a Muse - the deadline is Monday morning at 8:00 am EDT. Voting will begin at that time (and you can vote even if you didn't link up) and continue until Tuesday morning at 8 am. Results will be posted at noon. And a little birdy told me that my daughter Kate will be linking up for her first time! LOVE this card! 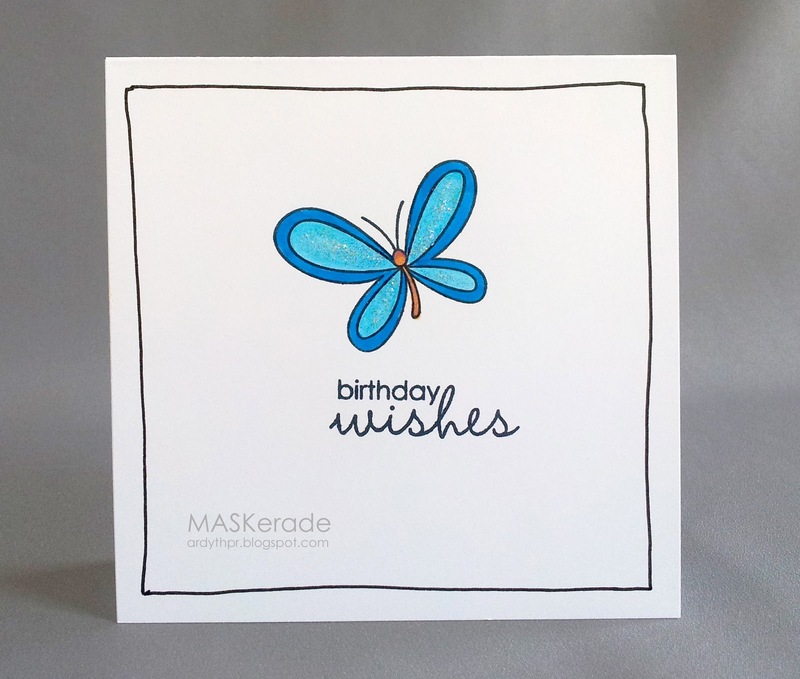 Love the butterfly, the lovely sentiment and especially the doodled frame. It's gorgeous! I love how you were inspired Ardyth. I love your doodled border and that adorable butterfly. The extra time paid off...the butterfly is gorgeous. Love the shimmer! And oh how I would love to live in your neighborhood! This is a very cute take on the Muse card. I sure wish I could have been at your little get together. Hey Ardyth!!! I love the simplicity of your card. The blue butterfly is amazing. Love the sparkling wings, your doodled frame and I think your sentiment pairing is perfect! Your card is definitely sweet and whimsical. 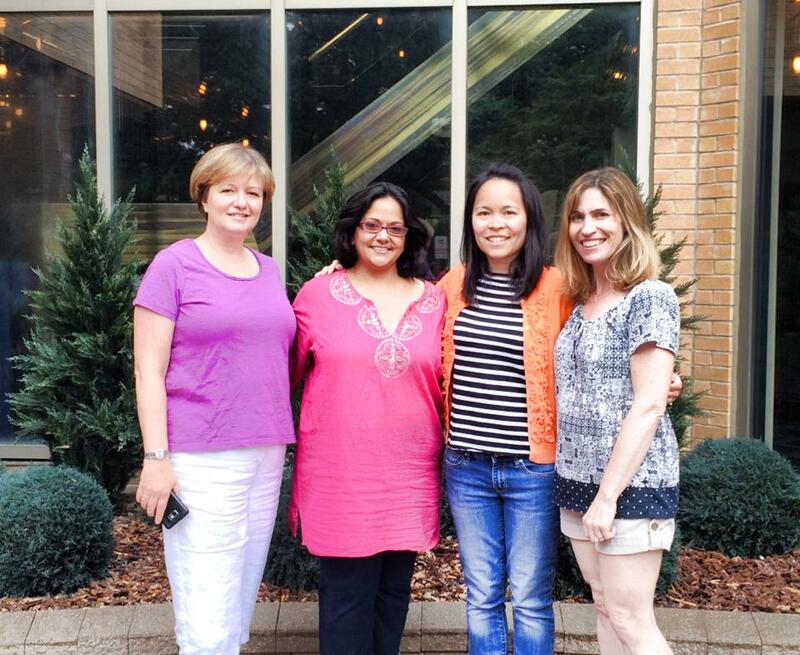 How wonderful to get together with crafty friends.